Alphabet Practice with Fry words - Oliver Poons Children's Co. Alphabet Practice with Oliver Poons & friends! Recognizing letters helps students learn about letter sounds and spelling. Our workbook has handwriting practice for every letter of the alphabet. We’ve also included practice writing Fry words (sight words) on the bottom of every page. 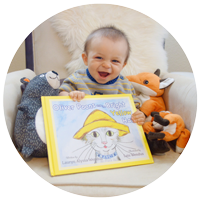 Order a copy of Oliver Poons worksheets and activities today!